Quad Biking at Taff Valley Quad Biking & Activities Quad BikingOver 12's and adults use the semi-automatic 90cc and 250cc Honda quads, and can enjoy a trek out through the countryside. All quad biking sessions start with a safety briefing and initial training on the practice circuit. Once the instructors are happy with your progress, you can follow them on a trek, around our 360acre working hill farm, over fields, through woodlands and over bumpy tracks. There is no pressure, we would like everybody to come and try the activity with no obligation to complete a quad biking session. No experience is necessary as training will be given by qualified staff at the centre but there is always opportunity for the more adventurous and daring riders to tackle rough terrain. We provide quad biking sessions for ages 7 and over, for details on quad biking for 7-11 year olds please go to our junior quad biking page. There is no minimum number of people required and we can also cater for large groups. Standard sessions last 1 hour, although your with us for longer with booking in and kitting out. We can do a 1.5 hours session to, depending on abilities and experience. Over 12's and adults use the semi-automatic 90cc and 250cc Honda quads, and can enjoy a trek out through the countryside. 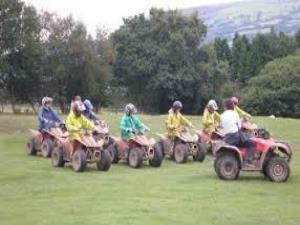 All quad biking sessions start with a safety briefing and initial training on the practice circuit. Payment by cash or cheque with guarantee card, no plastic. Small deposits may be required for groups or weekend bookings. From the South (Cardiff/M4) - Head onto the A470 towards Merthyr Tydfil. Leave at the 3rd exit for Rhydyfelin. Drive down the slip road onto a roundabout and leave the roundabout on the 6th exit sign posted EGLWYSILAN/SUPERSTORE/RETAIL PARK. Take an immediate right turn in front of the retail signs (don't go up the hill towards Tesco) then you should pass the large Griffin Mill Skoda/Peugeot garage on your left-hand side. Continue forward. The road will narrow to a country lane, proceed for about 700metres and take a left over a railway bridge (by our 1st brown sign), left again (2nd brown sign) and we are on about another mile further up the mountain. Turn left through a gate at the 3rd quad centre sign. From the North (Merthyr/Brecon) - Head for the A470 towards Cardiff. Leave the A470 at the exit sign posted TREFOREST IND.EST (NB: Not Treforest Univeristy of Glamorgan, but the one after). Drive down the slip road onto a roundabout and leave the roundabout on the 1st exit sign posted EGLWYSILAN/SUPERSTORE/RETAIL PARK. Take an immediate right turn in front of the retail signs (don't go up the hill towards Tesco) then you should pass the large Griffin Mill Skoda/Peugeot garage on your left-hand side. Continue forward. The road will narrow to a country lane, proceed for about 700metres and take a left over a railway bridge (by our 1st brown sign), left again (2nd brown sign) and we are on about another mile further up the mountain. Turn left through a gate at the 3rd quad centre sign.